The Eastfield resource pantry had its soft opening on March 28 and 29, providing eligible students with a variety of meal options and hygienic products. The pantry is located in front of C-104 and will be open every Tuesday from noon to 2 p.m. and every Wednesday from 4 to 6 p.m. 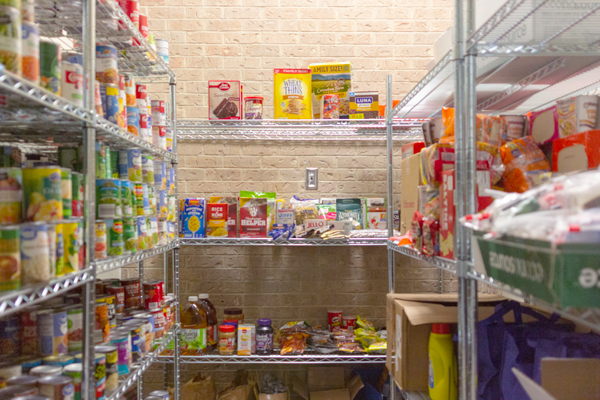 The pantry holds a variety of food items bought from the North Texas Food Bank and care packages with canned goods and hygienic products raised by student groups. The initiative is headed by the college’s Center for Equity, Inclusion and Diversity. The pantry is part of a districtwide effort to combat food insecurity among college students and was slated for its March opening after previous delays. Following the finalization of contract negotiations between the Dallas County Community College District and the food bank made the organization the primary provider for Eastfield’s pantry items, the college was tasked with detailing the roles of pantry employees and volunteers and hiring a program coordinator. Danae Bass, who was previously the academic enrichment coordinator in the Office of Student Engagement and Retention, was made the pantry’s coordinator. Ashmi Patel, director of the Center for Equity, Inclusion and Diversity, said she’s excited to have such an important role filled. Bass said that the soft opening was a good opportunity to inform students of the pantry’s sign-up process and allow them to get familiar with her as the face of the pantry. The pantry requires students to fill out an annual form to determine eligibility. Students who already receive food assistance, fall below the household poverty line or qualify for household crisis eligibility will be able to receive items from the pantry. Phi Theta Kappa President Roxanna Martinez said that her PTK members were anticipating the food pantry’s opening and had taken an active approach in helping stock it. Patel said now that the pantry is open, their focus is to get more information out to the community and possibly shift the pantry hours depending on student needs. “Now that we have a soft opening, we’re going to work on getting the word out, doing some more work on making students more aware on how they can use the resource pantry,” she said. Martinez said that PTK members plan to continue volunteering to help stock the pantry, and Patel anticipates multiple volunteer opportunities for students. Campus employees can also fund items from the NTFB by donating from their payroll.